Motoring expert and owner of Bridgend-based Car Dealer Leyshon Flint & Sons, Andy Leyshon, discusses why drivers should take care to avoid being a casualty of the latest storms to hit South Wales. With more wet weather predicted to hit South Wales today, following a week of flash floods, the internet is full of images of stranded cars. Whilst daredevil photographers are keen to capture a winning shot, it’s easy to forget that being out on the road in wet weather can be dangerous. A quick scan of the statistics reveals that a third of flood-related deaths are in cars. “The stats are pretty sobering!” says Andy Leyshon, owner of Leyshon Flint, a trusted Bridgend Renault dealer with years of motoring experience. People naturally feel confident when picking up their shiny new car, but Andy says that while a brand new Renault may offer you a little security in terms of 4 year breakdown cover, drivers shouldn’t feel complacent and deliberately go off on a storm chase. This week alone has seen stranded drivers needing rescue throughout Wales. 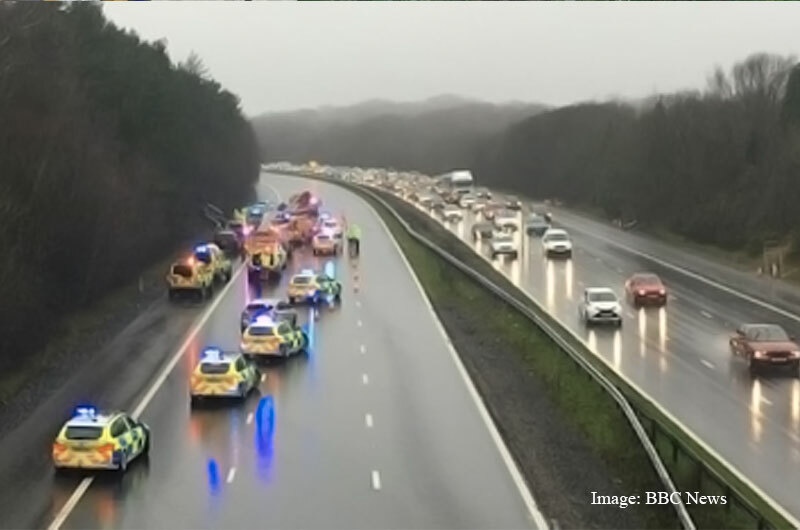 This week also saw drivers stuck on the M4 near Bridgend, due to multiple weather-related collisions. If you break down don’t prop the bonnet open while you wait. Rain-soaked electrics can make it harder to start the engine. Don’t drive into flood water that’s moving or more than 10cm (4 inches) deep. Let approaching cars pass first. Adjust your speed according to road conditions – you may be tempted to hit the puddles and make a big splash, or skid on ice to impress your friends. Don’t. An egg cupful of water in your engine will wreck it (yes, even in a new car! ), and a skid can easily cause you to lose control. It’s generally known that cars are more prone to breakdowns in Winter, most commonly due to battery issues. Water and electrics don’t mix, so invest in breakdown cover – it could save you money in the long run. Our new Renault cars come with 4 year breakdown included. Keep your car regularly serviced, in line with manufacturer recommendations. They know their cars, so listen to what they say! Of course, I would say this as a main Renault dealer, but be careful where you buy your car from. A winter breakdown could cost you big time – how much will it cost you if you have time off work when your car is off the road? A main dealer is a sure bet, because their standards will be regularly checked, they have spent years earning their reputation and each individual customer matters. ‘Dodgy Dave’ may be cheap, but after your car leaves his forecourt, what happens? ‘In-warranty’ repairs may not be done with durability in mind, and a day outside that warranty, he won’t want to know. Don’t be tempted to use hot water to clear your windscreen. The sudden change in temperature can cause the screen to crack. A broken windscreen is even more inconvenient when it’s snowing or raining. Lastly, be a responsible motorist. It sounds simple, but don’t run out of petrol and make sure you have good tread on your tyres. Ask us for a free tyre check anytime. So will Andy deliver harsh treatment to drivers who bring their cars for repair after ignoring his advice? He smiles.